"Historic, decorative and functional, hand held fans have been used for centuries in China, Japan, Korea and other Asian countries. Mrs. Lin's Kitchen celebrates the simple beauty of these enduring collectables with our selection of Eastern-inspired hand held fans. 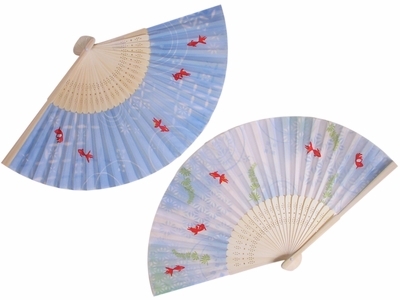 We offer a lovely variety of hand held Asian-style fans that are sure to make great gifts for holidays, birthdays and other special occasions. Explore our delightful selection of cherry blossom-theme folding fans in regal purple and rich browns, complete with pink and white flowers hanging delicately from outstretched branches. Or discover the grace and charm of our Chinese silk hand held fans featuring beautiful women posed in lovely gardens and other classic Eastern-style backdrops. If you're looking for an elegant addition to your display of Asian-style giftware, view our assortment of bamboo hand held fans featuring classic designs like white floral patterns against a striking navy blue background. And if you're searching for a unique accessory or party favor, our light-colored Chinese sandalwood fans with delicate lattice-like carved designs are sure to make a memorable impression. In addition to their traditional ornate beauty, fans are also a timeless and practical way to generate a cool breeze outside on a hot day or indoors in a crowded venue. Enhance most any wall, shelf or ensemble with lovely and classic hand held fan from Mrs. Lin's Kitchen!"